With summer around the corner, so comes the need for nice, refreshing dishes. 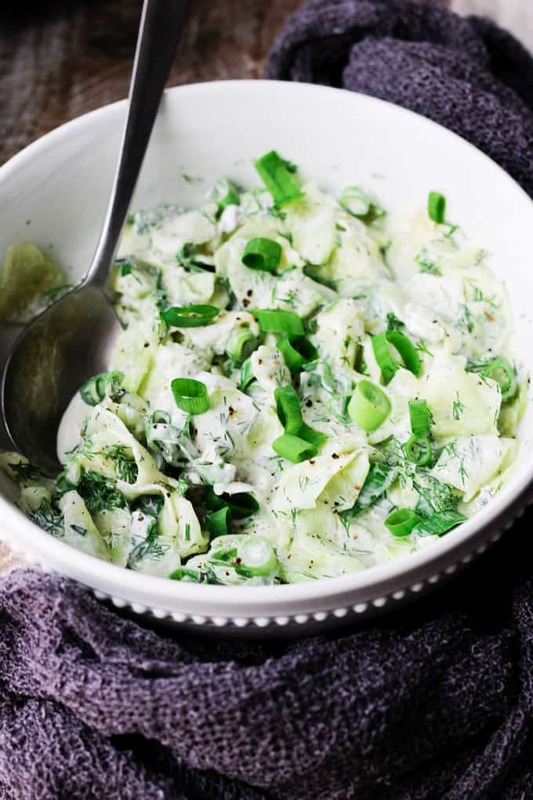 This Polish Cucumber Salad (Mizeria) should find its way to your summer dishes repertoire, it’s been in mine ever since I was born. Well actually I might have gotten carried away a little bit there; I wasn’t actually eating cucumbers right after I was born, but I certainly was no later than the age of one. I’m now in my 40s, so you can see how long I’ve been eating this cucumber salad. 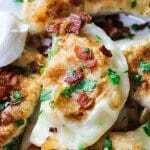 This is one of the most popular Polish Recipes. There is one caveat here, in Poland people tend to eat whatever’s in-season. That means that you wouldn’t have the pleasure of eating this cucumber salad during the winter months. Cucumbers are summer produce and they need to be eaten during hot months…which make perfect sense, as their flavor and consistency are super refreshing. Here in the US, cucumbers are available all year round; but they really taste best during the summer. But I digress… The point I wanted to make here is that this salad is family’s traditional recipe, and as with a lot of ethnic recipes, variations abound (which I’ll talk about below). There are actually two theories about it: (1) that poor peasants that lived in misery, voraciously consumed this salad; or (2) that an Italian queen, who married one of the Polish kings, was so homesick that every time she ate this salad she cried. [Side note, it was believed that she brought fresh vegetables to Poland]. I’m not sure which, if any, of these theories, are true. So, I guess that one will remain a mystery. How do you make Polish Cucumber Salad? Mix it all together and season to taste. Be careful with the salt, as your cucumbers were salted previously. Also, you may only need to add a little pepper. What are the different variations of Mizeria? Onions types (or perhaps exclusion of them altogether). If sugar, vinegar and/or lemons are something that you may like, then by all means..add them to your salad. 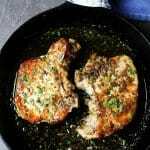 Or perhaps you want to omit green onions or add yellow onions or even shallots. Check recipe notes for details. 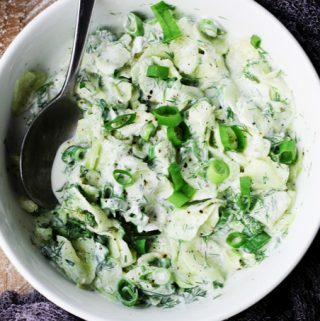 Which cucumbers are best for this Polish Cucumber Salad? When I was growing up the most ubiquitous type of cucumbers were the Kirby ones, which are normally used for pickling. The process would traditionally involve both peeling and deseeding the cucumbers. Nowadays, the English seedless cucumber is the one I use the most. It’s widely available in the US, and it doesn’t need to be deseeded. How can I lighten up this Cucumber Salad? 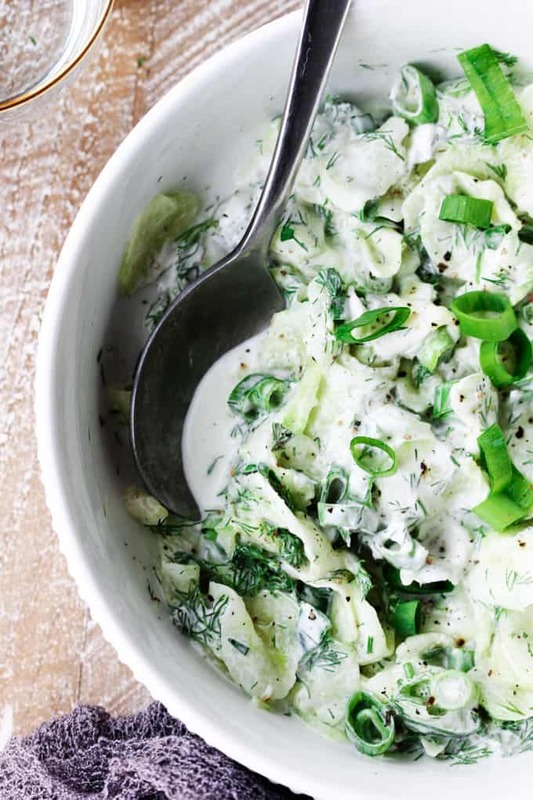 As advised, this traditional Polish cucumber salad calls for sour cream. However, if you’d like to go a little lighter then swap it out for some Greek, or natural, yogurt with your choice of fat content. What shall I pair this Mizeria with? For me, cucumber salad is forever married to mashed potatoes. As a matter of fact, sometimes that’s all kids would eat for dinner – just mashed potatoes with mizeria. Or on other nights, sometimes with just the addition of a fried egg. I know that may sound weird, but trust me it’s super delicious. Maybe you have some memories of your grandma making this dish, or maybe you ate it on your travels, or maybe a Polish friend served it for you, or perhaps you’ve never had it and are curious. Whatever your motivation, please share your feedback with me and let me know how much you liked this Polish delight. Oh, and if anyone knows the real reason why my ancestral Poles actually dubbed this a “misery” salad, then please let me know. Because as far as I can tell, the name definitely does NOT befit the dish! With summer around the corner, so comes the need for nice, refreshing dishes. 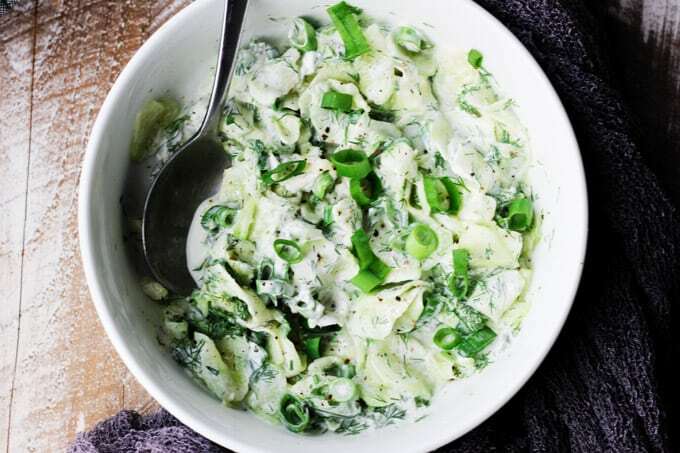 This Polish Cucumber Salad (Mizeria) ought to find its way to your summer dishes repertoire. 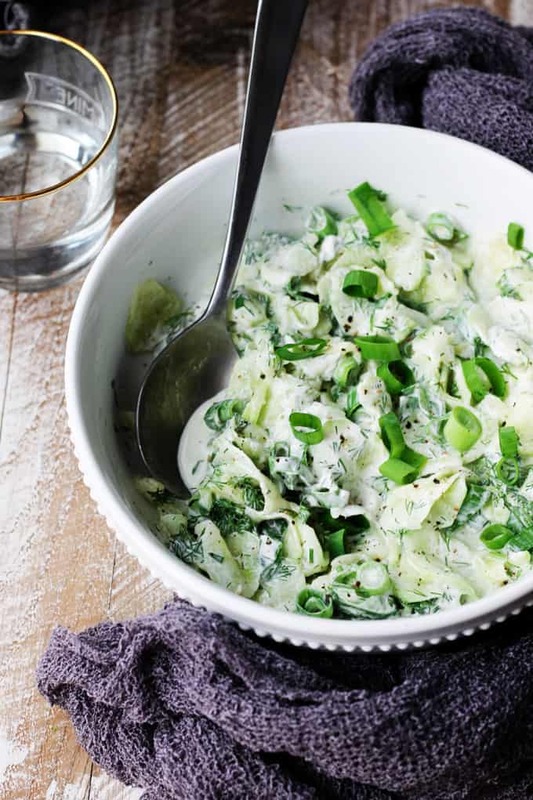 Simple ingredients like cucumber, dill, green onions, and sour cream are all you need. You can chill it before serving. 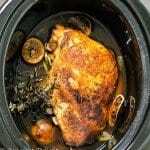 **This recipe calls for 2/3 cup of sour cream, but you can add less or more depending on your consistency preferences. ***For an even lighter version of this salad use Geek or natural yogurt instead of sour cream. Thanks so much for sharing your tradition. This cucumber salad is totally calling my name!! This sounds delicious and simple! I think cucumber salad goes so well with lots of dishes and I’d love it as one of the side dishes at my next barbecue. Absolutely, it really is great for BBQ! 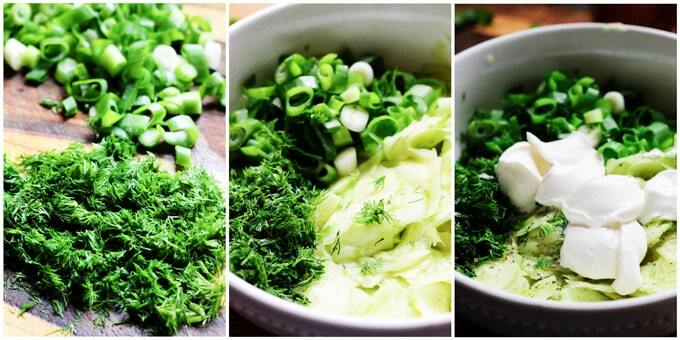 I could totally get on board with eating this cucumber salad with mashed potatoes. I’m going to try that – might get my son to eat some veggies with his mashed potatoes! 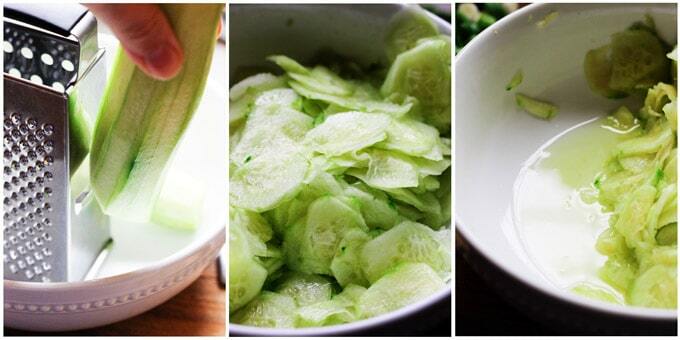 I absolutely love the freshness of cucumber during the summer, this salad sounds so delicous. A perfect side to BBQs! Yes Emily! It is so good during the summer especially for BBQs. Cucumbers will soon be in abundance in NY! I can’t wait to try your Misery salad with them! That is true! I cannot wait.